What’s wrong with standards-based education? Let me count the ways. The word “standards” in and of itself is not a dirty word. People have standards every day– for how they will negotiate work, personal relationships, and ethical decisions. However, it seems that when we use the words “standards” associated with education too many people assume that implies something rather broad based and benign as in the description I just offered. Additionally, standards suggest that we are staving chaos off at the gate … that without some sort of standards steering our educational system, schools and educators will operate like some Wild West show with no rules or order, resulting in national unmanageability. So when we hear the word “standards” based education, the phrase alone lulls many people into a false sense of stability and security that our children are being taken care of because these standards are the gate keeper at the door between success in learning and abject chaos. This is indeed a false and dangerous sense of security. What we need is to ask some serious and complicated questions about standards-based education. Standards are a pre determined list of expectations for skills, or standards for content that will be practiced, met, or achieved by students (and/or educators). They are the framework for curricular and instructional decisions, usually both. In broad terms, standards are what we want every child to be able know and do. But who decides what knowledge is of most worth? In decades past education standards have been set with all sorts of hidden agenda such as “civilizing immigrants into an American (read: white middle class) set of behaviors and beliefs, or preparation for factory work during the booming industrial revolution. For the last few decades they have been determined by the business community, Business Round Table and corporate executives. Rarely, if ever, have we had a national effort in which students themselves determined the standards for an education that prepares them to create the world they wish to see, but instead are predicated on expectations of the wealthy and powerful elite to mold students into a world crafted in their own image. The Common Core standards we have now are not like what Ayers was describing (above) as a student-centered education. Rather they are a way to harness schools to suit the needs of industry. The language du jour is “college and career readiness.” This is a very telling phrase, since corporations (Bill Gates and Co) and colleges (College Board led by David Coleman, chief architect of the Common Core standards) are writing the standards to serve their needs, which is to prepare students for a college degree they can longer afford, or a job that won’t even be there for them given the high rates of joblessness. This is different than standards that would be set by a different philosophy of education—what is education for? Where are the interests, abilities and desires of students and their communities in the standards? Who sets them? And who is forced to achieve them? And to what end? If we use standards as a rhetoric to say we are providing for students, we can be relieved of the responsibility of providing other needed resources or conduct a re examination of social structures and institutions that perpetuate inequality. However, standards are not a concern of wealthy kids and schools—why is this? By claiming one set of standards, we create the illusion of equal opportunity without the community development needed to create affluence which has been documented more than any other factor to determine school success. The truth is that standards are for poor kids. Wealthy kids don’t need them. Accountability measures strangle schooling in poor communities-wealthy schools can take them or leave them because they have the infrastructure of family, income, education and community that enables those students to do well, standards or not. Further, standardized curriculum and testing now (and historically) reflect the learning styles and knowledges of upper middle class White communities. While kids from lower socio economic neighborhoods and students of color have a wealth of knowledges, experiences, and values worthy of our attention, they are never included in a standards-driven world. Why is that? A so-called failure of our students to achieve high standards has been called a “threat to national security.” Since success with standards correlate highly with one’s zip code more than innate intelligence, we can see this language as code for “poor people are a threat to national security,” and they must be managed in order to contain the threat. By standardized measurements like tests. 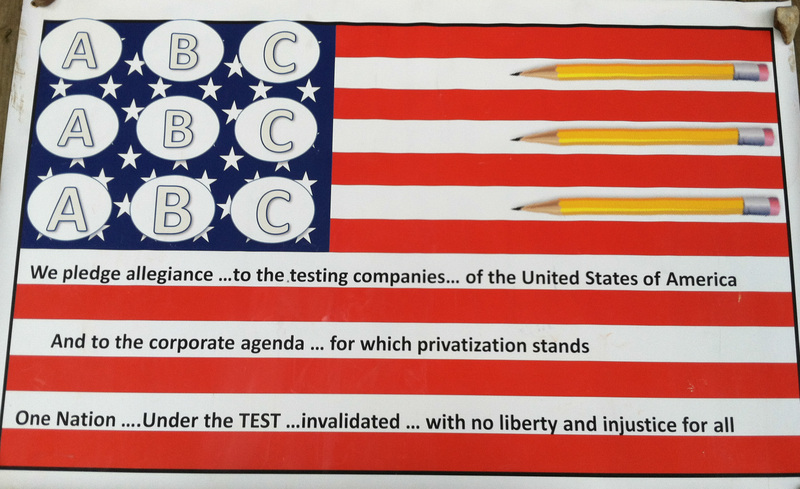 Corporations and testing companies create one cut score or set measurement for all children. This practice of measuring success on these terms assumes there is one right answer for any question, that learning is done in one way, or that tests by their “nature” are inherently reliable or valid since they make claim to being “scientifically” created. Both science and statistics have been manufactured to cater toward the bias of humans throughout modern history. We have in the past used “science” to justify any range of absurd and inhuman sexist and racist intuitional practices, and even a statistician will tell you that they can make the numbers say anything they want. Blind unquestioning faith in anything “scientifically” standardized with numbers attached is a fool’s errand. Testing companies that can save money on one set of standards for streamlining tests, less costly tests. According to a paper written by the Fordham Institute (2010) called How Will Common Core Initiative Impact the Testing Industry, the demands of NCLB cut testing profit margins for testing companies. The creation of the PARCC and SBAC consortia eliminate the need for every state to “create its own tests and thus cut down on the production costs” that are aligned to the Common Core. The textbook/publishing companies that deliver the standards via their test books and curricular materials. Given the push for college and career standards, the problems with both that I outlined earlier, it might seem as if these standards are a way of winnowing the pool of successful candidates. Furthermore, if as evidence and research proves again and again, that socio economic status and cultural capital are the biggest determining factors for success in achieving the standards (as defined by standardized tests and on their own elitist terms) then it is the students from high income communities of privilege that will “rise” to the top, leaving low income students behind. The vicious cycle of blaming teachers and students themselves for the failure to achieve high standards set forward by a mentality of expectations crafted by those with privilege. (W)hen advocates of this system of “profit education” talk about the growing poverty that exists in schools and the need to be able to provide for the well being of the total child, poverty is obfuscated by an insistent claim that it is an excuse, not a cause of poor performance. The facts say otherwise. Overall 20 percent of students in the U.S. live in poverty. Based on the 2009 PISA results, U.S. students in schools with a poverty level of less than 10 percent performed best in the world in math, reading and science. However, as the poverty rate increased, the results showed, student achievement decreased, and students in schools with poverty rates greater that 50 percent ranked in the bottom of all students internationally. This cycle creates a sick public narrative that distracts us from the responsibilities of colleges and corporations to bear any of the blame for exacerbating inequality or access to opportunity, foisting such outcomes upon the shoulders of those forced to bear the burden of playing a corrupt game rigged against them. “The problem with NCLB was that it was based on a false premise, that somehow tests can be used to pressure schools into delivering equitable outcomes for students. This approach did not work, and as we are seeing with Common Core, will not work, no matter how many ways you tinker with the tests. The idea that our education system holds the key to our economic future is a seductive one for educators. It makes us seem so important, and can be used to argue for investments in our schools. But this idea carries a price, because if we accept that our economic future depends on our schools, real action to address fundamental economic problems can be deferred. We can pretend that somehow we are securing the future of the middle class by sending everyone to preschool – meanwhile the actual middle class is in a shambles, and college students are graduating in debt and insecure. The entire exercise is a monumental distraction, and anyone who engages in this sort of tinkering has bought into a shell game, a manipulation of public attention away from real sources of inequity”. Most folks are versed in (or at least have heard of) terms like “military industrial complex,” “factory farms” or even “education industrial complex” (a phrase used by educator Troy Grant and others). I believe these terms are still useful for a qualitative description of some of the facets of what we are witnessing education reform today. One-size-fits-all testing and curricula harken back to the days of industry and efficiency models. Indeed, as I have cited myself in other papers, how often we treat schools and children as if they were concentrated feed lots on a factory farm. And the military industrial complex reveals the powerful influence of “lawyers, guns, and money” (to quote Warren Zevon) in national and international geo-political and economic policies. If current policies are not grounded in solid pedagogical or developmental research, facts, or even a record of success…then WHY are such education policies being pushed faster, harder, and on larger scales? This framework presented here perhaps answers that question. Current and future education reforms allude to something different happening in 2014(building on decades of groundwork). We are living in a historical moment in which previous paradigms are shifting beneath our feet, though certain traits may be passed along. We are a POST industrial world. With the influx of technology, uses and abuses of “big data”, and of economic policies of last few decades (circa Reagan through the present) favoring private corporate interests, the “industrial complex” paradigm is taking on a new face. I’d like to refer to this new phenomena and the Corporate Global Privatizing Complex (CGPC). I have framed out a chart of the key areas in which CGPC is largely apparent, and leading the way. The goal of conducting this brief broad sweeping analysis to is demonstrate how and why education policy is what it is. The landscape of public education is shifting precisely because it is being orchestrated by the same people using the same techniques and are moving toward the same goals. In other words, education reform (aka privatizing public education) does not exist in isolation. Education is the cornerstone of the larger global architecture reframing the production of, ownership of, and distribution of basic social services (national security, food security, and right to public education… intellectual security?) Note: One might easily add healthcare, environmental concerns, water and other basic human needs or services to this as well. I just focused on these basic four to exemplify how it all fits together. According to NextUp Research, the research arm of Global Silicon Valley Corp., the e-learning market in the United States is expected to grow to $6.8 billion by 2015, up from $2.9 billion in 2010. In 2007, the number of Blackwater’s federal contracts, according to Erik Prince: “More than 50” with a total value in 2006 of all contracts at 1 billion. Who (or what) do the key players in a Corporate Global Privatizing Complex all share in common? 1) The American Legislative Exchange Council (ALEC) leading the charge for crafting legislation that decimates public funding for public services and places public services into private (for profit) corporate hands. 2) Bill Gates—a hand in EVERY pie on the chart. Blackwater sold their clandestine intelligence services to the multinational Monsanto. The purchase of 500,000 shares of Monsanto, for more than $23 million was made by the Bill and Melinda Gates Foundation. Gates funds fast food franchises that buy and sell from factory farms and GMO products. Gates donated 2.2 MILL to GEO. Monsanto funds charter schools: and Teach For America. Pearson contracts with the military. Pearson has had some questionable (and profitable) contracts dealing with Homeland Security going back to 2003. The Council on Foreign Relations promotes the need for national standards as a need for national security, and that student testing data should be shared with Department of Defense for “security” purposes. Erik Prince is the founder of private military corporation Blackwater USA. Prince is a former Navy Seal and a “billionaire right-wing fundamentalist Christian from a powerful Michigan Republican family. His sister is Betsy Devos. The DEVOS family invests large sums of monies into privatizing education through charter schools and vouchers. Monsanto creates more than genetically modified foods. The company also formerly manufactured controversial products such as the insecticide DDT, PCBs, Agent Orange, Monsanto’s Central Research Department began to conduct research for the Manhattan Project under contract from the US government. Monsanto assisted in the development of the first nuclear weapons. Bill Gates controls more than 90 percent of the market share of proprietary computing and Monsanto about 90 percent of the global transgenic seed market and most global commercial seed. Pearson is the world’s largest education company. The GEO Group, Inc. (GEO) is the world’s leading provider of correctional, detention, and community reentry services. 5) Each of these giant monopolies use lobbying and pressure via ALEC legislation to get government contracts to provide privately managed “public” services or needs, using our tax payer dollars to earn them billions of dollars and promote human suffering. 6) THEIR POLICIES AND PRACTICES DO MORE HARM THAN GOOD TO THE PEOPLE OF OUR COMMUNITIES. Their actions to “innovate” not only fall short of their promises…they have the exact opposite effect.